This is an exposure of a psychic scam being worked today that is almost foolproof. The unusual thing about this scam is that the sucker in most cases never realizes he was conned. Therefore he never reports the psychic to the authorities and the psychic can operate in the same area for years with immunity! Millions of people go missing each year and many unscrupulous psychics and mediums claim they can find these people for a FEE. This is an exposure of a scam that was worked on the author in his younger years. 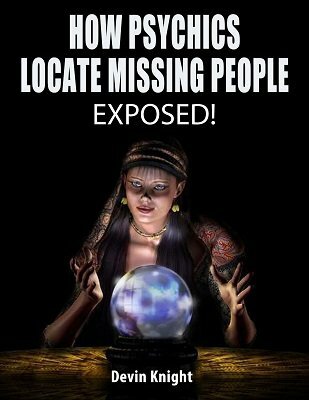 It shows step-by-step how the psychic makes it appear that he has found the missing person. In most cases, he even leaves the client with tangible proof that makes it appear that he did what he claimed. This tangible proof is used to prove he is for real and not a fraud. Does the client ever get reunited with his loved one? No, but a few times the client will be only days away from where the person was. An ingenious scheme that is being exposed to prevent you or your family being taken by the racket. This is still being worked today, but the secret is not too well known among magicians and mentalist. The author is aware that some mentalists are doing this feat to impress people, but not working it as scam to get money. Should you consider doing this? The ethics of doing this convincing feat are discussed within this PDF. This information is intended for entertainment and historical purposed only. Use at your risk. Neither the author nor the publisher warrants this information for any subsequent use.